Fresh food and water needs to provided. Pelleted feeds can stay fresh for a week inside a hopper so that they are dispensed ad-lib as the hens require food, however it will soon go mouldy and cause disease if it is not kept dry. 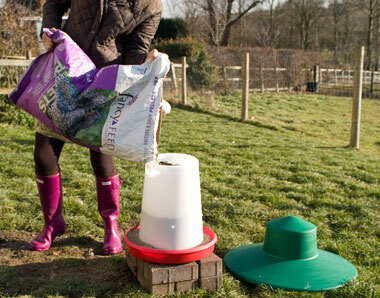 Place food containers under cover or purchase a rain hat to keep the rain off. Clean water containers with a small hand brush before refilling them with fresh water. A quick 1 minute health check – stop for a minute and observe. Make sure everything appears normal. Collect eggs and keep an eye out for broody hens over the spring and summer months. Scatter a handful of corn per bird in the late afternoon as a treat. Essential: Close the pop hole at night and open it in the morning to protect chickens from predators (especially foxes). Open the coop as soon as you are awake and it is light outside, close it at dusk as soon as your chickens have gone to roost for the night. An automatic doorkeeper has been one of the most useful items I have bought to lock up my chickens at dusk and let them out in the mornings. It is one of the more expensive items I have bought but it is very reliable (the batteries last well over a year) and I am not in a panic trying to get home as it gets dark and the best bit…. I get to have a little extra sleep in on the weekend! Chicken houses should be cleaned out at least weekly to prevent a build up of organic matter, which puts your birds at more risk from respiratory problems and disease. Between May and October, check perch ends and cracks for Red Mite. They are very common and the sooner you find them, the easier it is to get rid of them. You can read more about cleaning out on this page here. Clean feed hoppers – a wipe will sometimes do. Provide fresh greens at least twice a week, more often if chickens don’t have reasonable free range or if grass is short / there is snow on the ground. Check grit hoppers and top up as necessary. 5 minute check: Pick up a couple of birds and give them a quick health check. Check that they haven’t lost weight and examine between their feathers, particularly around the vent area for lice. Check your stocks and re-order as necessary. Give 2% Apple Cider Vinegar (ACV) in the water for one week a month. I always do this on the first week of every month so that I don’t forget. Feed Verm-X monthly at 2.5g per bird. January Think about breeding. 2 to 3 year old chickens are best for breeding as they have resistance to disease and their eggs are now a good size. Get incubators tested and ready for use if you plan on hatching this spring. Add a vitamin supplement to the water if the weather is cold and rub Vassalene into large combed cockerels such as Leghorns to protect against hard frosts. Provide regular greens when the ground is frozen. If snow falls, clear the ground immediately in front of their house so they can get out. February Order spare heat lamps for brooders, chick crumbs and anything else required if you are going to incubate. Add a vitamin supplement to the water to birds that are breeding or if the weather is cold. Continue rubbing vaseline onto the combs of large combed cockerels if necessary. Provide regular greens when the ground is frozen. Check fertility of eggs in incubator. March Collect eggs and start incubating to get new stock. Fertility should now be at its best and all hens should be laying by now. 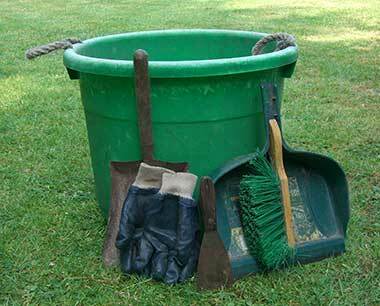 Add gravel, sand or wood chippings to well used ground as it turns to mud in the rain. Worm the flock with Flubenvet. April Spring clean chicken houses. Set broody hens and tend to chicks if you have hatched them. If you have a cockerel, fit poultry saddles to hens so they don’t lose feathers from their backs. Build or buy any new housing required for new birds. Remember not to mix young chicks / growers with older birds but let them out on warmer days for a couple of hours around mid-day to get some fresh grass. May Red mite season begins – start preventative red mite treatment. Let chicks / growers out onto grass in covered runs and make sure they are locked up at night. June Continue preventative red mite treatment. Inspect fencing fully as June to September is a popular time for fox attacks. Make sure birds have shade and their water is not in the sunlight so they can cool themselves off by drinking. July Continue preventative red mite treatment. Get any painting or treating of houses done when the sun is shining. As chicks can be sexed, remove unwanted cockerels as they will cost you to keep and won’t be productive. August Continue preventative red mite treatment. As chickens come into moult, give them extra vitamins, a handful of dried catfood (for extra protein) and ACV to help them to grow new feathers. September Continue preventative red mite treatment. Move this years hatch (now pullets) to their new accommodation or integrate them with the flock as they will soon start to lay. Worm the flock. Repair houses and runs that need fixing before the winter. Replace sand or chippings if used in smaller runs. October Red Mite Season Ends – Stop preventative red mite treatment as weather turns cold. Review stock levels: Don’t over-winter stock that isn’t going to be of use next year. Remember young cockerels who get on fine now will become competitive and start to fight in the breeding season. November Make sure you have sufficient water containers for the freezing weather to come. Consider visiting some of the poultry shows that are held during the Autumn. Make sure hen houses are draft proof. December Add a vitamin supplement to the water every other week if the weather is cold. Provide regular greens when the ground is frozen and extra corn so they have more fat (from the maize) to produce more heat. 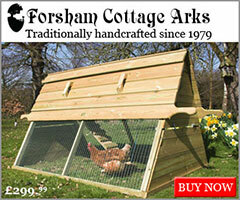 Ensure hens can get shelter when the weather is bad, especially in cold winds and rain. ·Fresh food and water needs to provided. Pelleted feeds can stay fresh for a week inside a hopper so that they are dispensed ad-lib as the hens require food. Clean water containers before refilling with a hand brush. 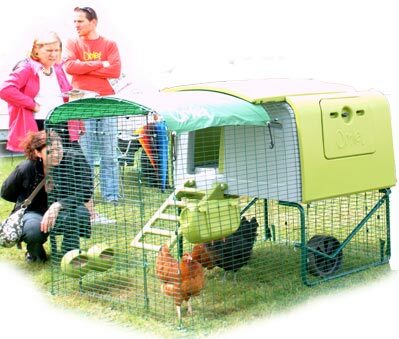 ·Close the pop hole at night and open it in the morning to protect chickens from predators. An automatic doorkeeper has been one of the most useful items I have bought. ·Chicken houses should be cleaned out at least weekly to prevent a build up of organic matter, which puts your birds at more risk from respiratory problems and disease. ·Provide fresh greens at least twice a week, more often if chickens don’t have reasonable free range. ·Give 2% Apple Cider Vinegar (ACV) in the water for one week a month. I always do this on the first week of every month so that I don’t forget. ·Feed Verm-X monthly at 2.5g per bird. Get incubators tested and ready for use if you plan on hatching this spring. Add a vitamin supplement to the water if the weather is cold. Provide regular greens when the ground is frozen. Order spare heat lamps for brooders, chick crumbs and anything else required if you are going to incubate. Add a vitamin supplement to the water to birds that are breeding or if the weather is cold. Start incubating to get new stock. Worm the flock with Flubenvet. Build or buy any new housing required for new birds. Remember not to mix young chicks / growers with older birds. 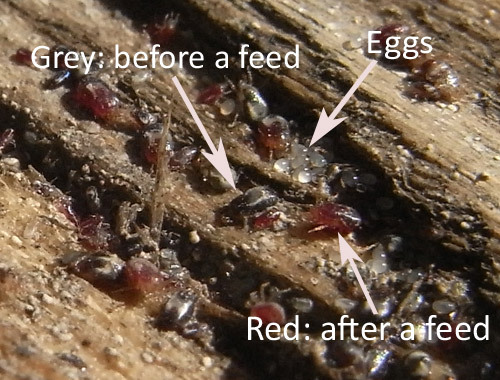 Red Mite Season begins – start preventative red mite treatment. As chickens come into moult, give them extra vitamins and ACV to help them to grow new feathers. Repair houses and runs that need fixing before the winter. Replace sand or chippings if used in smaller runs. Red Mite Season Ends – Stop preventative red mite treatment as weather turns cold. Review stock levels: Don’t over-winter stock that isn’t going to be of use next year. Remember young cockerels who get on fine now will become competitive and start to fight in the breeding season. Make sure you have sufficient water containers for the freezing weather to come. Do you have any routine jobs I have missed from this list? Please leave me a comment below. What a relief to find your site. I inherited 4 chickens when I bought my house. They were shared between the previous owner and a neighbour so now I have half responsibility for their welfare. There is much to learn. One thing in particular I am unsure of…..my neighbour feeds them kitchen scraps and throws them directly into the run. Is this wise? They love boiled up veg, bread and fruit. I am worried about nutrition and hygiene issues and all of the hens but one have stopped laying. Thanks so much for the advice on treatment for red mites and worming. It’s wise not to feed more than 10-20% of their diet like this because you’ve no idea of how close it is to their required diet. Have a read of my page on feeding – but bottom line is eggs are mainly protein so the diet has to be high in protein to sustain egg production and scraps won’t give them enough. one of my hens is 16 weeks and has started laying, she is laying soft eggs, Can you give layers pellets or mash to a hen before 18 weeks? Yes, she’s about the right age to change over to layers gradually. Hi – thanks for a great site. This has been my go to reference before and since our girls arrived a month ago. I have 5 girls in a coop with 4 nesting boxes so there is plenty of room. 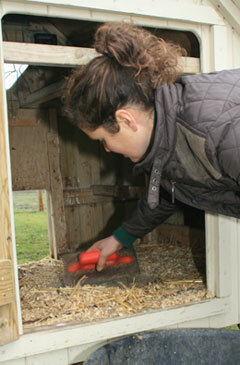 I clean any droppings daily leaving the shavings and straw if its clean and topping up if necessary. 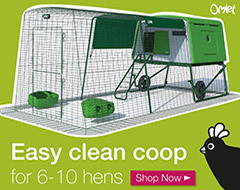 Through the winter months, how often should I thoroughly clean the coop out with poultry guard, disposing of all bedding soiled or not? And also – how often during the summer months? It all depends on the size of the coop, number of hens and how long they spend in the coop. Usually cleaning once a week is sufficient although some people, like you suggest, pick off the worst of the droppings daily. I clean my main coop out every other week but it is fairly large. In summer if we get red mite, I will clean more often. If the bedding is getting wet in winter, it should be changed but if it’s still dry and reasonably clean, you can just pick the worst off or rake it over. Hi. 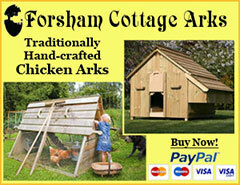 Thanks for the great website it has helped loads since I got my 6 hens last May. My hens are really good layers and even in winter I often got 6 eggs but sometimes hey have a spell of hiding their eggs and as they don’t have a run and they live on a farm there are lots of barns and sheds where they can hide them. I’ve tried putting golf balls in the most commonly used laying spots but this doesn’t seem to be working. Any advice highly welcome. Can oyster shell be put in the same feed dispenser as layers pellets? Tricky but normally once they start laying in nest boxes, they carry on. Other than containing them, or darkening the nest boxes with a feed sacks hanging over the top half, I can’t really think of anything else. Yes Oyster Shell can be fed with the pellets but often it gets flicked out or left in the bottom since it isn’t eaten as much as the pellets.